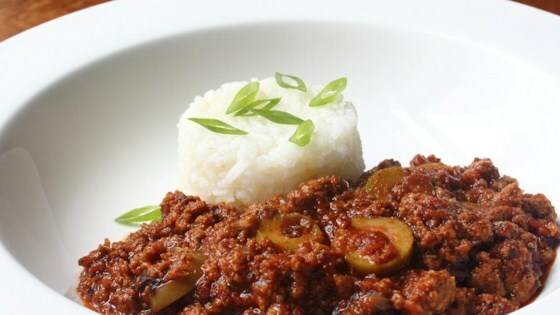 "A Cuban creation, picadillo is one of the world's great ground meat dishes. I went with beef, but you can add some pork and/or chorizo. Serve it with rice." Heat oil in a large skillet over medium-high heat. Add ground beef and break up into small pieces with a spoon or spatula as it browns. Cook until meat completely loses its pink color, 8 to 10 minutes. Add diced onion and salt. Cook until onions turn translucent, about 5 minutes. Add pepper, cumin, cinnamon, bay leaves, and cayenne pepper. Cook 2 minutes. Add garlic and cook 1 minute. Stir in red wine vinegar, crushed tomatoes, and water. Cook a few minutes while deglazing pan. Add currants; bring back to a simmer. Reduce heat to medium-low; cover and cook until meat is tender, 15 to 20 minutes. Gently stir in sliced olives; cover and cook another 10 to 15 minutes. I've done all the cooking at my house for over 40 years. This is the first dish with olives that my wife actually liked. Chef John ROCKS! So delicious, wasn’t sure about olives but my kids r pretty adventurous and they loved it. Added diced potatoes to it and I know it’s not the original recipe but it was so delicious with it. Wonderful! I did use chorizo for .5 lb of the ground beef. Also, no raisins.